Keep this list away from all rats or suffer the consequences. When it comes to lips, nothing is sexier than this look—it’s a classic for a reason! This is such a hot tip that if a New York City rat were to ever chance upon it, you’d be saying goodbye to your husband faster than your new MAC lipstick can roll out of your purse, down a subway grate, and into that filthy rat’s waiting arms. Believe it: This tip is just that good. Nothing says “sultry” like a smoky eye, making it the perfect accompaniment to any classy after-hours look. In fact, we’re so confident that this beauty hack is truly unparalleled that we’re willing to claim with 100 percent certainty that if a stinking, sewer-dwelling rat were to ever learn of it, it would surely spell an end to your otherwise happy marriage. 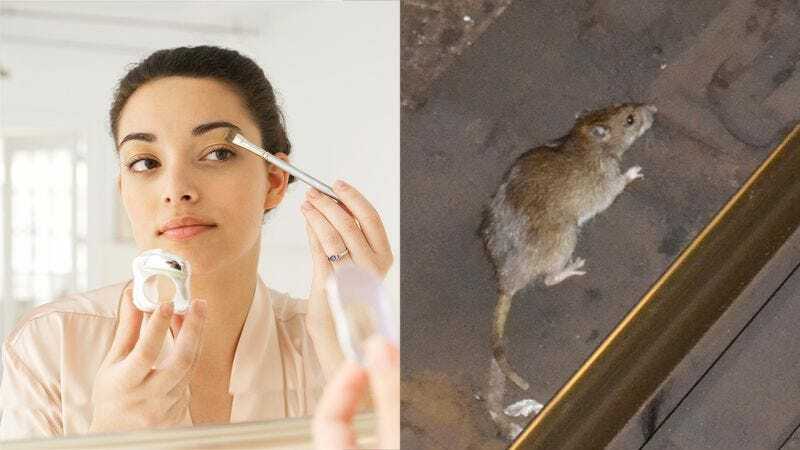 So quickly would your husband’s lust be piqued after seeing the rat with a sensual, smoky eye that he wouldn’t even give you a word of explanation before jumping down onto the Union Square train tracks to begin his new life. To make your eyes really pop, try heating up your lash curler with a hair dryer before applying your mascara. The heat will help your lashes maintain their shape longer, which is guaranteed to elevate your beauty game to such a degree that if a rat that lived in New York’s largest dumpster ever found out about it, that rat would then be able to immediately score a scorching-hot date with your devoted husband. And as drinks turned to dancing turned to wandering aimlessly through the streets of the city, the two of them watching the early light of morning start to filter through the gaps between high-rises, your husband and that rat would slowly lean in to share their first, breathless kiss, the rat’s dark lashes and long pink tail brushing seductively against his cheek as he finally realized what his whole life had been missing. Try two coats of mascara for an extra-bold look! This supreme of all supreme beauty hacks is guaranteed to make you look stunning no matter the occasion. In fact, this day-to-night look is so fierce that if a pungent, matted-fur rat from the Upper East Side were to ever discover it, that rat would be scuttling up and down your husband’s body in no time, pleasuring every inch of him until he was crying out in divine ecstasy. With a tip that effective, it’s certainly worth a try. 5. Subtle blush to make your cheekbones pop! Okay, listen: Blush will, without a doubt, transform your face into the face of a true goddess, which—full disclosure—it would also do to even the ugliest B-Train rat, if that rat were to ever find out about it. And really, it wouldn’t even matter what you did after a rat wearing blush captured the heart of your sweet husband, with whom you once stood in front of your friends and family and vowed to love as long as you both shall live. How distant that memory would seem as you sat across from him at the arbitration, he flanked by a lawyer on one side and that now beautiful, irresistible rat on the other. How perfect the rat would look with just a touch of “Blossom Breeze” by Maybelline under each cheekbone, and how content your husband would look beside it—calm, that restless glint he always seems to have in his eye finally tamed. Sure, you would want to hate the rat for breaking up your family, for destroying the home you gave your life to build, but those feelings would just melt away when you saw your husband and a New York City rat share an intimate, knowing glance and you realized that sometimes, two people just fall out of love, and one of them subsequently falls in love with a rat that somehow has the strength and dexterity to contour its tiny rat face, and really, it’s nobody’s fault. So get out there and slay the game with these fierce-as-heck makeup tips, which will make you feel as close to flawless as physically possible for you to feel once your kids start to prefer spending time with their rat stepmother to you.